We have lived on our boat for nearly a decade. We’ve been exploring the Pacific for several years, making our way first to Mexico (where our second daughter was born), then to Hawaii, British Columbia, Alaska and finally back down to Mexico again and across the Pacific to New Zealand. This year, we set sail for Fiji, arriving in early June and expecting to spend the whole season exploring this island country. It’s now halfway through the season, and we've spent the last three months in the eastern part of the country. Makogai is the fifth Fijian village we've become acquainted with, and our simple but sumptuous meal with Chief Watsoni is at least my twentieth meal sitting cross-legged on a voivoi mat. By now, I feel somewhat acclimated to life in Fiji. I've become enchanted with the friendly people of these islands. I know how to wrap my sulu modestly around me before entering the village boundaries. I have learned how to grate coconut and make lolo. I am a connoisseur of kava. Even my children have come to crave the taro-leaf-coconut-cream standard meal in these parts. But no matter how much we embrace the culture, I am acutely aware in the moment I bring that spoon to my lips that there's still no getting around the basic fact that we are different. I've sat with women on the floors of houses all across the South Pacific and prepared meals. The typical tool is a dull but strong knife which they employ as can opener, carver and shucker. A machete is more common than a butter knife, and more essential. Silverware is non-essential, as I've seen demonstrated time and again. A few weeks ago when three women from Koro Island's Nabuna Village spent a day on our boat fishing, they insisted at lunchtime that they prepare the meal. They had carefully packed taro root and cassava from home, already cooked and ready to eat. The only thing they required for the meal was a large pot, in which they boiled the fish whole with chili pepper and lime. When the meal was ready, I reached for bowls for individual servings, but they shook their heads: No,we don't need those. They fished out the largest specimens from their catch of the day, a dozen or so small reef fish averaging about five inches, placed them carefully into four bowls for us and poured the chili-lime broth over top. I gingerly picked at the paltry specimen looking up at me from my bowl, trying to pull the miniscule bits of meat from the fragile skeleton (with a fork).Meanwhile, my husband and daughters took their cue from our Fijian friends, who settled themselves comfortably into our cockpit and proceeded to devour their share with their hands from one large bowl, sucking and slurping at the bodies, heads, fins, tails and bones till there was nothing left but the juicy broth. This they consumed by passing the bowl around and sipping loudly, each in turn. Clean-up was simple that afternoon. On another occasion, a group from Nabuna Village came to our boat to spend an evening. We drank grog and rum and told stories long into the night. They insisted on providing the entertainment, too, in the form of Fijian Music. We were looking forward to this: I had visions of ukuleles and drums and rhythmic handclapping. Instead, one of them produced a CD from a stained, sandy bag and asked me to put it into our player. I could barely tell which side was up, so mutilated was the once shiny disc. In no time, however, our new friends were swaying and beating their hands to the reggae-like music, wholly unaware of the scratches, pauses and skips in the line-up. Our new friends were happily humming along to “their” music — which ranged from UB40 to a local band who had recorded their music in Koro Island's recording studio — and they were proud to be sharing with us. This led me to reflect on the pragmatism of these islanders. Everything they do is supremely practical. The make grog bowls out of old mooring balls and recycle large squares of wrapping paper for interior wall decorations. They have no use for shoes — Chief Watsoni of Makogai told us that he moved back to his island from the city of Levuka (a town of about 3000 residents) because, among other things, he was tired of wearing shoes (he tossed aside his watch, too). They even reuse old DVDs and CDs, making them into shiny adornments on their trees. Furniture is deemed unnecessary; all major activities happen on the mat, either inside or outside, as evidenced by the permanently bruised, swollen, and calloused talus: a tell-tale sign of a lifetime of sitting cross-legged, and a clear indication that we are from a different world. Indeed, everything about the way these islanders move sets us apart. They seem deliberately slow in speech and contemplative to a degree that tries even the most patient of souls, but can climb a coconut palm before you can even utter the short syllables, “yes, please.” We notice that even our children, who have grown up on a boat and are fairly adept at swinging, swimming and scaling vertical things, look ponderous and awkward in the presence of Fijian children. But I do not mean to paint a single-sided, romantic picture of the “simple island life”, and our typical First World-Third World dichotomy would be misleading. Fijians have whatever 21st century technology they can get their hands on: cell phones, radios, televisions. They eagerly accept any movies we pass along. They rely on diesel-powered generators until 9 o'clock at night, after which the cell phone becomes even more important because of its accessory flashlight. Yet even though we come from a technologically advanced place, it is not our technology that draws them to us. What interests them about us is that we are culturally and socially different. And they welcome us into their lives precisely because of that difference. I can relate to that. When it comes to reef fishing, tree climbing or even just hiking around the island, we get sorely beaten every time (even with our rubberized protective footwear). We are not bendy like they are. We have a great big spear gun, but they catch more fish. We feel ridiculous quite often, even in the most modest challenges. We haven't even attempted to ride a great turtle. Natives want to be proud of “their” white man, as they call an epicurean like myself. They are disappointed if their white man does not live up to expectations. They want to admire him, brag about him, serve him in the grand manner. Now this doesn't mean that we have to flaunt our “western” ways — they are revealed even without us trying. But it's true that islanders are just as curious about our ways as we are about theirs. We “brag” about our encounters to our friends back home, and they do the same. We noticed the gleam in the eye when, one after another, our new friends took turns at the helm when we sailed to a nearby anchorage together. 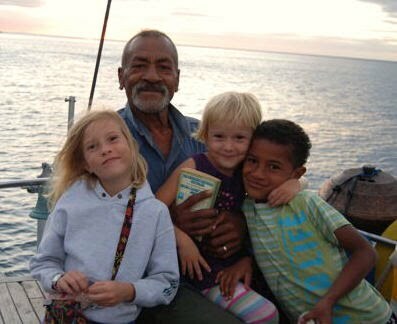 Later during our visit, Mele confided that they usually do not board the visiting yachts in their bay, that we are the first people who stayed long enough to get to know them and invite them to our home. I can understand why this was special for them; just as we like visiting their homes and seeing their lives up close and personal, they were given the chance to peer into ours, too. We opened our home to them, which broke down one barrier between us. But at the same time, I'm sure we nevertheless “lived up to expectations” in our kaivalagi ways. I liked the reciprocity here, and our extended visits with each other allowed them and us to view the “otherness” of our lives first-hand. I feel an immense sense of wellbeing from our encounters in South Pacific villages, and I wonder if it's because I sense on a rather basic level that we are each seeing the other culture, extending our respect, while also recognising the good in our own. Our time in Fiji has been a cultural exchange in the best sense of the word. We are all a little richer from these interactions. Our close proximity to each other has laid open a path to appreciating another culture while at the same time honouring our own. Frisbie's writing is of course dated, and our brief encounters with island culture do not compare with his nearly native existence. But I like the overall sentiment here, and I think about it every time I crumple myself awkwardly on the floor or instinctively reach for a spoon when I'm meant to drink from the bowl. I feel silly and inwardly admonish myself for my cultural clumsiness. I am constantly aware of my “privileged” heritage and tread lightly on what I perceive to be fragile Fijian turf. I often find the sharing of western wealth around these parts distasteful, dripping in a kind of cultural imperialism and superiority that I try my best not to perpetuate. I even shy away from the typical kaivalagi's predilection for colourful sulus and tattoos and flowers behind the ear — I recognise it's an attractive and easy way to express appreciation for something beautiful, but I also perceive it as a kind of cute fetishisation that makes me wary. I don't want to see island life as a novelty for me to wrap up and take home. But then I think that perhaps what Frisbie was saying was this: that just as these encounters are special to us (and we proudly proclaim it with our flowers and sulus and tattoos), they are special to the islanders too. Because we are different. Because I ask them about their history and they ask me about my family. Because we wonder about the Good Friday Coup and they don’t wonder about leaders beyond their village boundaries. Because we can't remember all their children's names and they say, a little sadly, when they meet our daughters: “only two?” Because we ask to hear Fijian radio and they turn it on and play Michael Jackson. Because my five-year-old asks why they are brown and they in turn want to pinch her soft pink cheeks and stroke her straw-blonde hair. Because they think it's a pity we don't have cassava and taro where we come from, and I realise I favour a life filled with books over all the taro fields in Fiji. Because I regret that I can't climb a coconut tree yet still prefer using a spoon to sip my soup. And because they boil bananas and I fry them. There’s no escaping Louisa's good-natured guffaw as she passes the plate of fried banana fritters on to Manini, and then Kalesi, and then Liti. Each time they pass the plate, they tell about the crazy kaivalagi cooking up the bananas in a pan, and they laugh a little harder. All quotations from Robert Dean Frisbie's letters taken from James Norman Hall, The Forgotten One and Other True Tales of the South Seas (1952: Little, Brown). Thank you for sharing this, Michelle. What great experiences. Wow, this is exactly the kind of experience I seek in our eventual travels. Thank you for all of your insights. We are living aboard in Ketchikan, Alaska and hope to take off South in a couple of years. My name is Michael Boyink and together with my family of wife and teens have been a fulltime RVer for 4 years now. A while back we started TopFamilyTravelBlogs as a way to keep current with other traveling families. We initially had just other RVers but recently have broadened the scope to include any family traveling full time in any mode. I just wanted to let you know that we added your blog to the mix of sources so hopefully can send some traffic your way. Your new posts should appear on the paper the next day. If you care to link to TopFamilyTravelBlogs.com from your site you can find logos at: http://b4a.us/a/6125 (no worries if you don't want to, we don't require it, this isn't a money-making effort on our part). If you know of other family travel blogs feel free to suggest them - we'll add them if we haven't found them already.